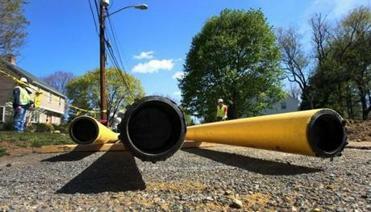 Enlarged natural gas pipeline proposed for N.E. A Houston pipeline company has begun exploring the expansion of a major regional pipeline to bring abundant supplies of natural gas to New England from nearby shale formations, a move that could help lower heating and electricity costs here. Spectra Energy Corp. estimates that increasing pipeline capacity in Southern New England by about 15 percent would save gas and electric customers - including roughly 3 million in Massachusetts - up to $651 million a year. It would allow the area to further benefit from the boom in natural gas production inPennsylvania and New York, although there are no estimates yet on the potential effect on individual bills. Increased production has already brought natural gas prices to their lowest levels in a decade. Easier access to Northeast natural gas fields could further lower prices here, helping to moderate one of New England’s greatest competitive disadvantages: high energy costs. 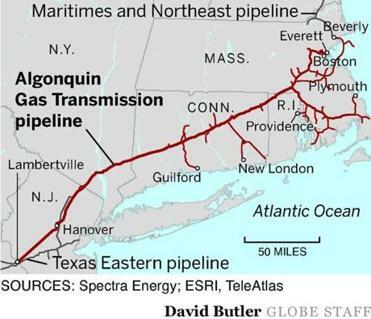 The proposal would replace parts of the existing Algonquin Gas Transmission pipeline, which runs1,120 miles through the Northeast to its terminus in Beverly. The pipeline often runs at capacity. Long the one region in the country where oil remains a popular fuel for heating, New England appears to be on a natural gas binge. The project, according to Spectra, would cost about $500 million to build, and $150 million a year to maintain and operate. The proposal is still in its earliest stages, and it is uncertain when or if it would get underway. It typically takes about three years to complete such a project, including regulatory approvals. Spectra said it has already started to gauge support among the region’s utilities and power generators that use natural gas to make electricity. Spokeswomen for the two largest utilities, Northeast Utilities of Boston and Hartford, and National Grid in Waltham, said they have made no commitments to Spectra. Currently, about half the electricity in New England is generated by natural-gas-fired plants. In Massachusetts, nearly 60 percent of the state’s electricity is made with natural gas, and more households heat with natural gas than fuel oil. “It’s very important that we continue to expand the gas system in Massachusetts,’’ said Barbara Kates-Garnick, undersecretary of the state’s executive office of energy and environmental affairs. A spokesman for Attorney General Martha Coakley, who is the state’s ratepayer advocate, said expanding pipeline capacity could lower costs for customers, but any proposal would get close scrutiny by her office. “We would carefully examine any proposal to add pipeline to determine whether it is in the best interest of ratepayers and to ensure that any associated costs are properly controlled,’’ said the spokesman, Brad Puffer. Spectra’s proposal is an example of how unlocking previously unreachable natural gas reserves in the United States is changing the energy equation for New England and the nation. In the Northeast, the Marcellus shale stretches across a half-dozen states, including Pennsylvania and New York, and holds about six years worth of recoverable natural gas, according to US Energy Department estimates. Use of the resource is not without controversy, however. The drilling techniques used to extract natural gas from shale include the use of numerous chemicals and large amounts of water - causing concern among environmentalists and home owners worried about contaminated ground water and other problems. Federal and state leaders have been working to better regulate the drilling industry and ensure that wells are built and drilled safely. Spectra has been floating its pipeline proposal for more than a year, but it could start gaining more attention from other industry players soon. In February, the Federal Energy Regulatory Commission initiated discussions on the growing interdependence between natural gas and electricity. With natural gas considered the cleanest of fossil fuels and production booming, power generators are increasingly turning to natural gas to create electricity. That is raising concerns among regulatory commissioners and energy policy makers that unless more pipeline capacity is added to help provide a consistent supply of gas to make electricity, as well as enough to provide heat to homes, the reliability of regional power grids could be threatened. Gordon van Welie, chief executive of ISO New England, which operates the region’s electric grid, agreed, saying shale gas provides an unprecedented opportunity for the region, which has historically had high energy costs in large part because of its distance from production centers such as the Gulf of Mexico.